How cool or warm your house is throughout the year is a direct result of the color and material of your roof. That’s why choosing the right roofing material and color for your home is challenging, as you are faced with an overwhelming amount of options when it comes to products. If you’re looking to stay more energy efficient, do some research into the optimal color and material for your next roof in Fort Worth. Some colors reflect heat while others absorb it. Here are some common roofing colors that can make a large difference in your heating and/or cooling bills. Black and dark-colored roofs: These will attract and absorb the heat, causing your attic and/or the top of your house to be warmer in all seasons than a lighter-colored material. These are ideal for cold climates because they retain more heat in winter. Light colored roofs: On the other hand, light-colored roofs are traditional choices for warm weather climates, as they repel heat and don’t absorb it as readily. The main factor in determining how the type of roof you install will affect temperature inside the home is the material you choose. The U.S. Department of Energy says the temperature in your attic during the hottest days of summer can vary by up to 50 degrees depending on the material you choose for your roof. 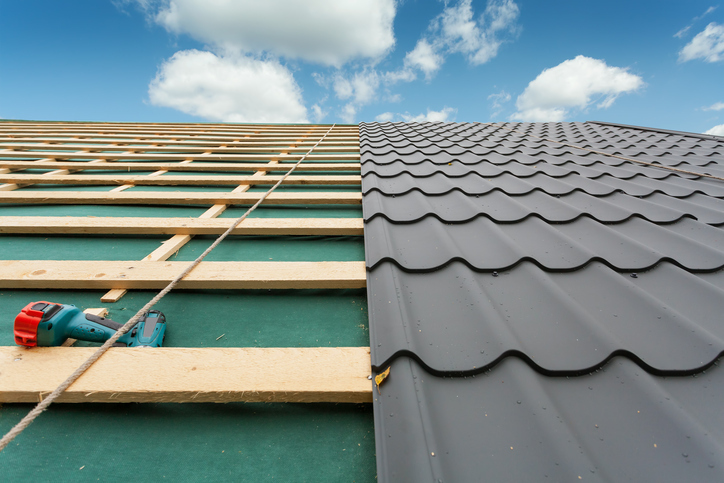 Here are some popular roofing materials and how they affect the temperature of your house. Traditional asphalt shingles: The most popular roofing material by far, this type of roof has low reflective properties, despite the color of shingles you go with. That’s because those asphalt granules diffuse the light in many different directions, with only 30 percent of light hitting asphalt roofs being reflected away. The rest is absorbed in the roof. So, the heat that’s transferred from your roof to the inside of your attic will keep you warmer in winter and require more work by your AC system in the summer to cool off the house. Metal: These have high reflective properties – even those painted a dark color. Metal reflects most of the sun’s rays, keeping attics at a more even temperature in all seasons. Solar reflective shingles: One of the newest roofing products, this type of shingle is designed to reflect a higher amount of the sun’s rays back into the atmosphere as compared with traditional asphalt shingles. They are coated with special reflective granules to give them more energy efficiency. Rubber flat roof materials: Rubber and polymer flat roof materials are also newer to the market, forming a watertight membrane across the flat roof. They’re available in light or dark colors, with both having high reflective properties. To learn more about the best colors and materials for your next roof, contact us at 817-435-4539.